Another day, another prize for TriAmp Mark 3 – this time, it’s the coveted 2016 German Brand Award for Industry Excellence In Branding in the Entertainment sector. The latest in a long line of prizes TriAmp Mark 3 has won – among others, it’s already taken home the 2015 Musikmesse International Press Award for Best Guitar Amplifier and Guitar & Bass Magazine’s Best Amplifier Over £1000 gong – the Brand Award recognizes the efforts of the H&K design and marketing teams in establishing the product globally. The Mark 3 is a made-in-Germany all-tube amp featuring the most advanced technology and specifications ever seen in a product of this type, meaning it fits firmly in the ‘premium’ category. 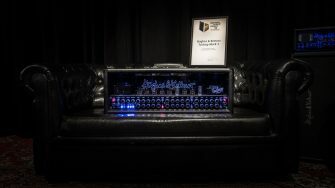 This in turn required a diverse marketing campaign to do the amp justice, and the H&K crew crafted a potent combination of traditional and digital materials to successfully make the Mark 3 one of the most talked about amps on the planet before, during and after its release, which took place at the 2015 NAMM Show in Anaheim, California and was marked by a signing session with Kiss lead guitarist Tommy Thayer. Get the full lowdown on TriAmp Mark 3 by clicking here!